The world is not going to end tomorrow because of fossil fuels. Man’s use of fossil fuels has not been proven to be the source of climate change. Climate change has happened since climate began. All of these statements are very logical and true, but somehow those pursuing ‘green energy’ work very hard to periodically convince all of us that if we use fossil fuel, we are all going to die next week (while flying around in their private jets). Green energy is in theory a great idea, but I can’t help thinking that the search for a totally green source of energy is somehow related to the search for the perpetual motion machine. It’s a great idea, but it defies the law of physics. At any rate, we are doing better at keeping the environment clean today than we were in the early 1900’s despite much greater energy usage. WattsUpWithThat posted an article today about some observations from scientists at the Field Museum in Chicago. Horned Larks are cute little songbirds with white bellies and yellow chins–at least, now they are. A hundred years ago, at the height of urban smoke pollution in the US, their pale feathers were stained dark gray by the soot in the atmosphere. 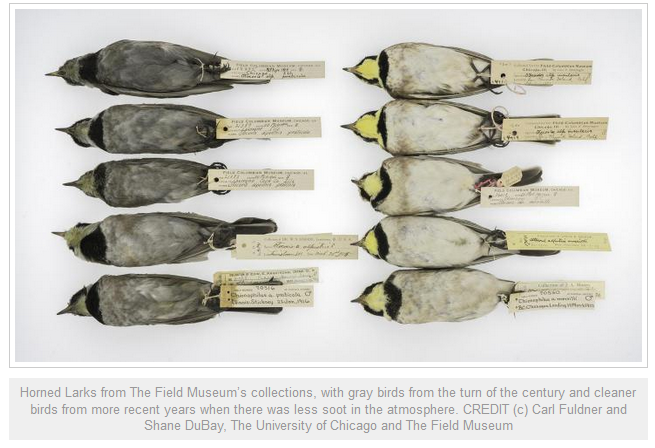 A new paper in the Proceedings of the National Academy of Sciences shows that the discoloration of birds in museum collections can be used to trace the amount of black carbon in the air over time and the effects of environmental policy upon pollution. “The soot on these birds’ feathers allowed us to trace the amount of black carbon in the air over time, and we found that the air at the turn of the century was even more polluted than scientists previously thought,” says Shane DuBay, a graduate student at The Field Museum and the University of Chicago and one of the authors of the study. He and co-author Carl Fuldner, also a graduate student at UChicago, analyzed over a thousand birds collected over the last 135 years to determine and quantify the effects of soot in the air over cities in the Rust Belt. …Birds were also ideal candidates for the study because they molt and grow a new set of feathers every year, meaning that the soot on them had only been accumulating for the past year when they were collected. And there was an apparent trend: old birds were dirtier, and new birds were cleaner. Fossil fuel is now abundantly available in America. We can use our scientific talents to make it as clean as possible. Like it or not, it is the basis of our economy. Have you ever wondered about the country we will leave our children? They will never know the smell of burning leaves in autumn or the experience of walking to the corner store to get penny candy (penny candy causes obesity and one Maryland couple is being investigated for letting their two children walk home from the neighborhood park). Now the Environmental Protection Agency (EPA) has a new target–backyard barbeque grills. The Washington Examiner posted an article yesterday about the latest meddling by the EPA into our everyday lives. Charged with keeping America‘s air, water and soil clean, the EPA has been increasingly looking at homeowners, especially their use of pollution emitting tools like lawn mowers. I wonder how much the addition of a catalytic converter will add to the price of a barbeque grill, making cook outs a luxury only the rich can afford. 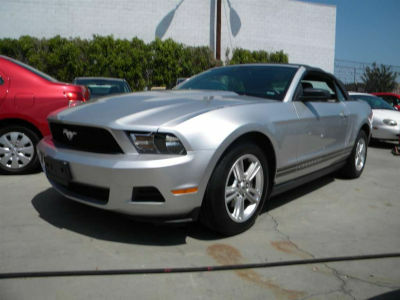 Yes, I know that’s a 2010, but that’s the picture I like! Steven Hayward posted an article at Power Line about Mustang’s birthday (with a few comments on her history). If you’re very clever (or keep up with Matt Ridley), you’ll know the answer is that the parked 1969 Mustang gives off more air pollution, in the form of unburned hydrocarbons evaporating through the old-school carbuerator and unsealed gas tank caps (among other places). A good object lesson in the advancement of engine technology. And the fact that the real heroes of environmental improvement were engineers with pocket protectors more than hippie environmentalists. Reuters is reporting today that China is banning its airlines from the European Union (EU) policy that charges a carbon fee for flights in and out of Europe. The carbon fee is essentially an additional tax and China has said that it simply will not pay the tax. The EU plan is intended to curb rising greenhouse gas pollution from aviation and fight climate change. Globally, emissions from aviation comprise about two percent of mankind’s greenhouse gas pollution and this share is expected to grow. “China hopes Europe will act in the light of the broader issues of responding to global climate change, the sustainable development of international aviation and Sino-European ties, strengthening communication and coordination to find an appropriate solution acceptable to both sides,” an unnamed official from China’s civil aviation authority said, according to the announcement. The interesting fact in this little dust up is that China is included in the EU plan to reduce air pollution. One of the problems with the Kyoto Protocol of 2006 was that the restrictions on greenhouse gases were not extended to India and China. Damaging air pollutants include sulfur dioxide, particulate matter—a mixture of extremely small particles and water droplets—ozone, and nitrogen dioxide. China accounts for roughly one-third of the global total for these pollutants, according to Krzyzanowski (Michal Krzyzanowski, an air quality adviser at the WHO Regional Office for Europe). China is not willing to play the global warming game. As I have stated before, I do not support dirty air. However, I think we need to make sure that any climate change is man-caused before we cripple the major free economies of the world in the name of saving the planet. The current ‘solutions’ to global warming are nothing more than a global redistribution of wealth–the major polluters are not included in the restrictions. Evidently China does not like being included in the efforts to save the planet.